Continuing my Voter Registration Maps series update, here are maps representing the changes in percentage by county of Republicans, Democrats, and Independents. 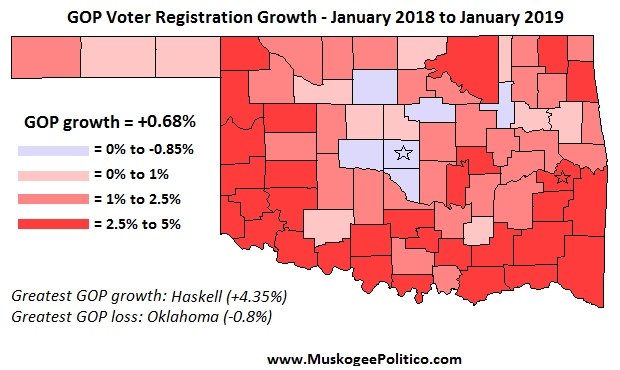 The OKGOP posted the lowest statewide increase and lost ground in more counties than any other year since I started making these voter registration maps in 2013. Republicans gained as a percentage of registered voters in 71 counties, while declining in 6 counties. 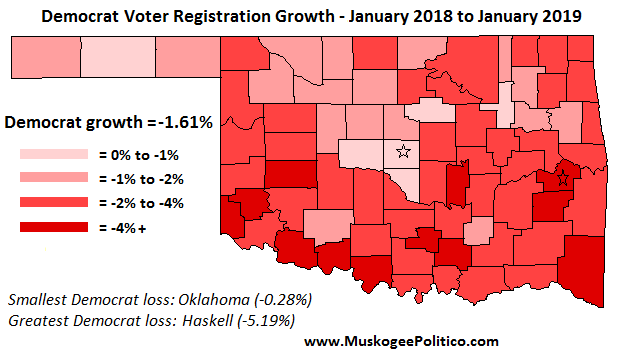 The greatest loss was in Oklahoma County (-0.8%) while the greatest increase was in Haskell County (+4.35%). The six counties that posted GOP slides were Oklahoma (-0.8%), Tulsa (-0.6%), Cleveland (-0.45%), Canadian (-0.26%), Garfield (-0.19%), and Payne (-0.08%). Counties in the west, south, and southeast had the best growth for the GOP, ranging from +2.5% to +4.35% as a percentage of voters. As with every year since 2014, Democrats declined as a percentage of registered voters in all 77 counties. 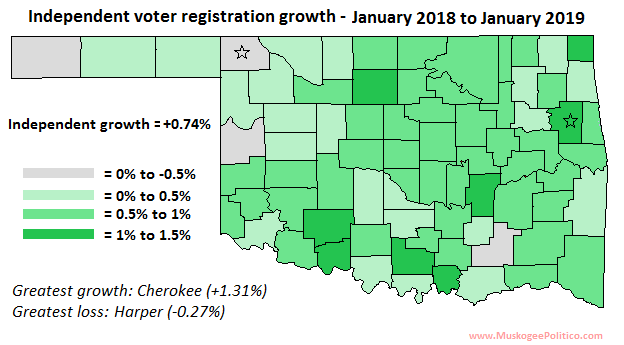 The smallest loss was in Oklahoma County (-0.28%) while the greatest was in Haskell County (-5.19%). Independents recovered from their nearly-stagnant growth last year, increasing as a percentage of voters in all but four counties. Harper County had the greatest loss at -0.27%, while Cherokee County had the greatest growth at 1.31%.